As I'm duck-walking to the nursery window [ow-ow-ow], a dark cloud of doubt is strolling smoothly behind me. A good mother would recognize her own baby, of course. So in about thirty seconds I'm going to find out what I am. A Good Mom or should we go ahead and call Children's Services now? I'm tense with anxiety. Will I know at first glance which bundled nugget of baby goodness belongs to me in that room? Or will I stand there like an idiot, just pretending like I'm admiring all the beautiful infants that came into the world the past evening? Right. I've gone with Option 2. Or rather, none of these squalling and wrinkled human beans look like something the Husband and I made. Well, that's just great. Now how to best handle this with the nurse walking towards me? Which one is mine? is something I can't seem to force into intelligible words. Instead I say, My baby's not in here. Where is he? Because really, I don't see him. He's not in the nursery. My mommy radar is telling me this. That dark cloud has turned from doubt to concern and preparing to dump a rainstorm of panic about my head. Oh, Mrs. Sword, says the kindly nurse. Your son is in intensive care for observation. We kept him there overnight just to keep an eye on him. Let me get him for you. We had a bit of rough go of it, the night my Favorite Kid entered the world. In the end though, all was well. And some of the health worries we had over the past nine months turned out to be no big deal after all. The worst of it was a broken nose on the poor baby bean, which made a pretty gnarly first photo, I do admit. We were then, and still today, truly blessed. It's this blessed life that got us into this puppy raising gig with Canine Companions for Independence. Sure, I love the part of bringing a new puppy into my home about every year or so, but I also get that feel-good thing about playing a small part in making someone's life better in a profound way. More about this is on a post from earlier in the year at Not Purely Altruistic. Because CCI uses Labradors and Golden Retrievers, and crosses of these two breeds, we can get the pups in two colors: yellow or black. And people have asked me, don't they all pretty much look the same? 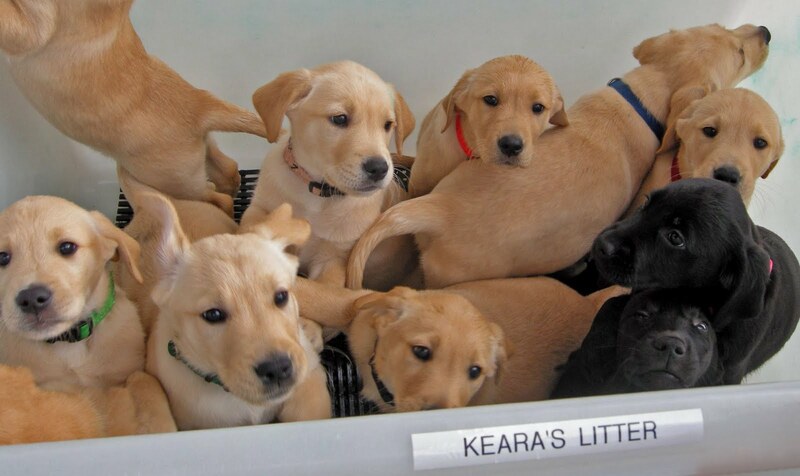 How can you tell which one is your pup-in-training when there's a bunch of them together in one photo? A puppy raiser knows, is my reply. And we do. We can identify our pups at a glance - it's their face, their posture, how they move. And honestly folk, even to the casual eye, isn't it easy to see each dog is unique in their own beautiful way? Let's use the photo below as a fer instance. We're at the Ohio State Fair this weekend raising awareness of CCI at our meet-and-greet booth. Good for CCI and some great socialization training for our pups. These furries are different ages, even varying shades of yellow, but we'll look deeper into appearances than that. 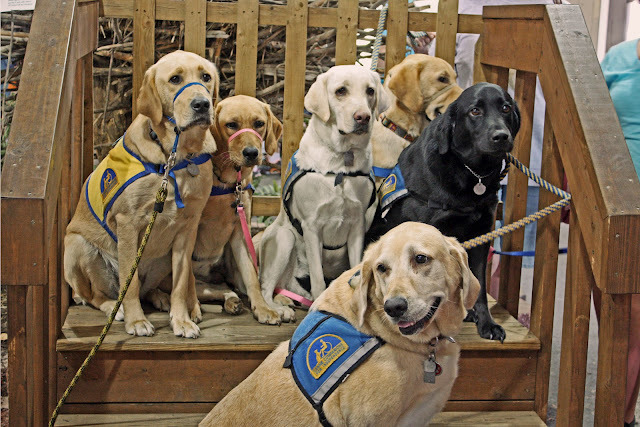 From Left: Yaxley, Hana, Oneida, Van, Natalie and Frankie in front. The position of the head tells us quite a bit; three have solid eye contact with their handlers. The light lady in the center, the black-coated chick on the end and the big fella in front. 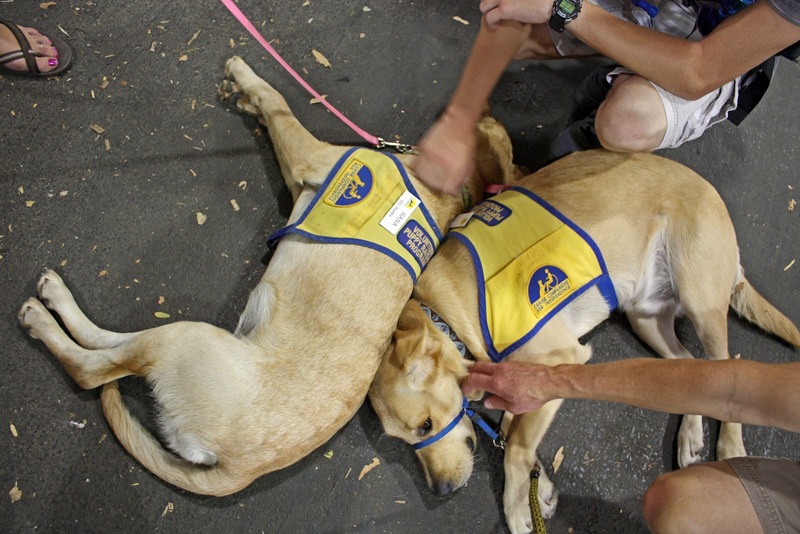 Oneida, Natalie and Frankie are wearing blue capes identifying them as assistance dogs. Each has eyes locked onto their handler and they are not going to let their person leave their line of sight. It gives me chills to see this devotion and their canine sense of responsibility. The other three are pups in training. This photo op reminded be of the paparazzi moms taking pictures of a group of teenagers posing in Prom attire - the kids never know which camera to be smiling at. Yaxley is on the left looking at the puppy raiser to my immediate right. Eight month old Hana seems zeroed in on me and wondering if I'm good for a biscuit treat. And Van is between a dog and a hard place back in the corner and yet handling himself well. 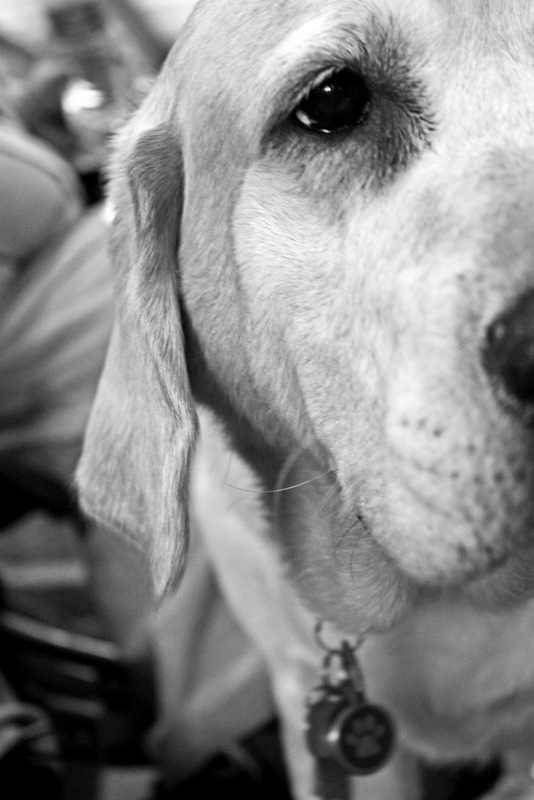 Just when I get myself all confident in doggy ID, I find this on the camera's memory card. Two yellow pups. Ok, so one is Hana, the other Yaxley. Both got each other's back for greeting passersby. The pink leash helps me to pick out Hana without actually looking at her name badge. And Yaxley has her by a few pounds, too, so there's that. Here's Oneida who is working a little harder than the pups. Here's how to properly greet people, young ones. Pay attention now, she says. 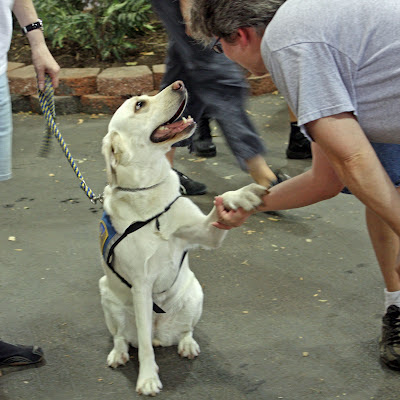 A fully trained assistance dog, she shows her stuff by engaging folk with adorable hand shakes. Just look at Frankie, here. No ordinary pet, he has old soul eyes, don't you think? The wisdom of the ages on this six year old fella. Alrighty, now a challenge for y'all. If you've been following Yaxley for a while, this should be an easy one for you. Let's put your Puppy ID skills to the test. Eleven pups in the litter, but we can take the two cutie patooties on the lower right out of the equation. Nine yellow pups to select from here. Which one is Yaxley, do ya think? Drop your guess in the comments. I'll let y'all off the hook with the answer in this week's Wordless Wednesday post. Hmmm... is that Yaxley on the far right, looking at the camera? Yaxley is the yeller feller on the far left in the green collar. You can almost, but not quite, see the ridge on his nose. This was their first trip away from home and right before their vet exam at CCI Santa Rosa. Look at those adorable faces. Some are ready for the adventure and others maybe not so much. One is Shirley. Her dog is old and had an accident that means that it cant walk too far. But she actually takes it to the park for a mini walk (even though it is blind) and then usually takes a neighbour's dog to the park for free, and does a few laps of the park to make sure the dog is properly exercised. They ran out onto their balcony, down the stairs and onto the street to find his 2007 Ford Mustang Judi Online Shelby GT 500 smashed on the corner of Oak and Stockton streets. Dozens of his personal trinkets line the room, including trophies, Funko POP figures, a "Fortnite" pickaxe, and a signed Detroit Lions football helmet. Medkeff said the look of the trophy wall will evolve as Ninja adds more personal effects. Roundhouse daftar judi online filled the studio with a fair share of secret features too, for example, Ninja's dogs have access to a small Murphy bed that pops out of one of the studio's walls. daftar judi online Forty is the new 30. Well, for Claudio Pizarro anyway. The Peruvian veteran became the second-oldest player to score in the Bundesliga after he netted one of the consolations in a 6-2 spanking for Werder Bremen at home by Bayer Leverkusen. daftar judi online "He said: 'They should have seen the pitches I played on in Rosario.'" Situs JudiMeanwhile, Al-Ikhlas mosque imam Mohamad Asri Othman said the programme saw the participation of 51 children between the ages of five and 10.